Now available with Windows CE, the CipherLab CP60 is the ideal solution for even the most demanding applications. With the most advanced features, such as LTE option, IP65 / IP67 ruggedness, 2.4 m impact resistance, and 3.8G HSPA+ with GPS tracking, the CP60 is the handheld terminal designed for various verticals including transportation and logistics, manufacturing, warehousing, field service, and field sales. 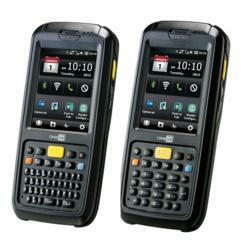 Running on a powerful 1 GHz processor, along with the function of laser reader, long range laser, and 2D barcode reader, CP60 mobile computer is the perfect device designed for mobile workers to complete their jobs. For assistance finding the right CipherLab device for your application, contact us at BarcodesInc. CipherLab has announced the release of the CP60 industrial mobile computer. The CP60 is packed with flexible wireless communication options in 3.8G HSPA+, 802.11 a/b/g/n, and Bluetooth V2.1 with EDR. The CP60 goes one step further and provides 4G LTE option which allows you to transfer large amounts of data in a speedier time. Its embedded GPS/AGPS allows total navigational control. Moreover, CP60 is armed with a 1GHz processor and multiple operating system options in Windows Embedded Handheld 6.5.3 and Windows CE 6.0 R3. It comes fully equipped with a large 4 GB flash memory and 512 MB SDRAM, which allows for extended storage of data and software. On top of all that, it provides versatile and accurate data capture with laser reader, long range laser reader, 2D imager and 5 megapixel autofocus camera. Your field agents are definitely ready to deliver a more efficient business operation.